The international team of experts investigating the MH17 tragedy in eastern Ukraine have called for possible witnesses to turn in any evidence that might back a scenario that the airliner was shot down by a Buk missile system. In a video address, released by the Joint Investigation Team (JIT), possible witnesses have been encouraged to share their photo and video materials to prove that a Buk surface-to-air missile launcher was transported through the Donbass region before and after the MH17 incident last July. "This appeal for witnesses does not mean that police and prosecutors have definitively concluded what caused MH17 to crash," the address said. "For that, more investigation is needed." A preliminary report of the official investigation published in September 2014 only said that the crash was a result of structural damage caused by a large number of high-energy objects that struck the Boeing from the outside. The report did not specify what the objects were, where they came from or who was responsible. No other verifiable evidence has yet been made publicly available, besides objective air control and military monitoring data partially released by the Russian Defense Ministry, which indicated the presence of Ukrainian surface-to-air batteries and warplanes in the area on the day of the Boeing shooting. Investigative historian, Eric Zuesse, was among those to criticize the JIT’s video, saying it doesn’t meet modern legal forensic standards. “The reconstruction that is hypothesized in that video…is based on hearsay and speculation, not on the best available evidence; and so, as presented there, it would not qualify to be presented to a jury in a democracy,” he wrote in a letter to RT. According to the historian, the video ignores the “extremely high quality evidence” of the side-panel near the pilot of the downed Malaysian plane. 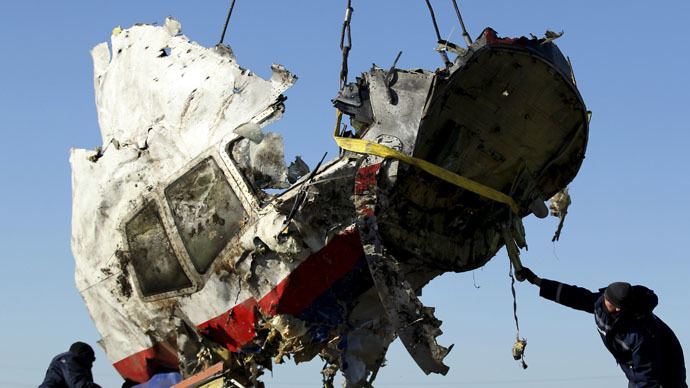 “The 30mm bullet holes in it are simply inconsistent with the MH17 airliner’s having been downed by any ground-based missile,” Zuesse stressed. Amid the JIT call for witnesses, a local resident in Lugansk region – whom Reuters cited as saying he saw evidence of a surface-to-air missile launched from rebel-held territory – has told RT that the news agency gave a false report of his interview. Russia's Foreign Minister Sergey Lavrov slammed Reuters’ report as“stovepiping”from a seemingly“respected agency”. “Attempts at distorting facts, enforcing theories as to what could have happened continue to exist, with some based on openly dirty intentions,” Lavrov told journalists. Yet the JIT investigators, pursuing their “leading” scenario in the crash investigation, have compiled a video that incorporated both social-media-sourced materials and unverified audio files apparently provided by the Ukrainian Intelligence Service, stipulating direct Russian involvement in the tragedy. The team alleges that the Buk missile launcher was seen several times around the time of the crash, yet no real evidence has been offered to support this theory. The US intelligence community apparently does not have any evidence to support Russian involvement in any way, investigative journalist Robert Parry told RT, citing his intelligence sources and own probe. Soon after the tragedy, Parry was told “their actual evidence was going in a very different direction.” Eight months after the tragedy the US stands by its old assessment of the incident all based on “circumstantial evidence” and social media reports, refusing to release new data, Parry says.